Its an old American story: A few hundred people gather around a handful of charismatic leaders to participate in rites they believe will open their minds, hearts and souls to a harmonious way of life, transcending the crass values around them. If enough of their neighbors join them, they believe, the nation and perhaps the world will experience a change in consciousness resulting in peace, love and justice for all. That story has been repeated many times in the name of political and religious movements in the U.S. But for a couple of years in the late 1960s, a different kind of movement evolved in the San Francisco neighborhood known as Haight-Ashbury. Its legacy is not an established church or secular institution, but art. Fun, rebellious, startling but accessible art that still testifies to the countercultural communitys idealism. The style called simply psychedelic proliferated on rock music album covers and in hippie fashions, but was nowhere so ubiquitous as on posters for rock shows and similar events. The spectacular fluorescence of this graphic art is surveyed in High Societies: Psychedelic Posters of Haight-Ashbury, a traveling exhibition currently on view at the Hood Museum of Art at Dartmouth College. Organized by the San Diego Museum of Art, the 90 artworks are on loan from Paul Prince, who has been collecting psychedelic posters extensively for more than three decades. The show features works by the big five psychedelic artists of the period: Wes Wilson, Rick Griffin, Victor Moscoso, Stanley Mouse and Alton Kelley. With these posters, the hedonistic visionaries of the Haight crafted a veritable manifesto that is articulate, attractive  and unrealistic. Consider the Wes Wilson poster identified as Blues Project, Great Society. Lights: Tony Martin. Avalon Ballroom, April 22-23, 1966. Like almost every piece in the exhibition, it was created to advertise a dance concert  a psychedelic entertainment somewhat more commercially organized but directly descended from the anarchic, LSD-dropping acid tests staged by Ken Kesey and his Merry Pranksters. Also like most of the artwork here, the posters visual content has little or nothing to do with the bands on the bill. Wilson didnt build his design around a photo of, say, the Blues Projects Al Kooper or the Great Societys Grace Slick. Instead, he framed the logo of the events promoter, called Family Dog, in red-white-and-blue bunting. The logo is the image of a long-haired Indian in a top hat, smoking a fancy pipe. Raucous, funky, hand-drawn letters proclaim the evenings musical lineup. Under the Indians deadpan cameo, a motto appears on a cartoonish scroll: May the baby Jesus shut your mouth and open your mind. It is the flag of the emerging counterculture, a lighthearted but undeniably confrontational call to open arms. This poster and its scores of companions celebrate not a particular personal or music-industry product, but a communal possibility. For hundreds of shows at the Avalon Ballroom and Bill Grahams Fillmore Auditorium, and for events such as the Gathering of the Tribes for a Human Be-In and the legend-making Monterey Pop Festival, psychedelic rock posters advertised group experiences in which the dancers on the floor were as important as the bands onstage or the lights and images flashing on the walls. 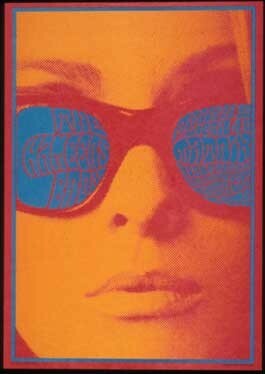 The posters of the 60s attempted to communicate the uninhibited motion, 3-D kaleidoscopy and palpable volume of rock concerts through the use of wild color  especially in hot, eye-popping complementary colors  surreal incongruities of imagery and, perhaps most characteristically, lettering that defied legibility. This swirling, curvy text was inspired by Art Nouveau signage from the 1890s; a gorgeous, closet-sized sideshow of fin-de-siècle works by Alphonse Mucha and other post-Impressionists is included to demonstrate these influences. Most of the psychedelic posters were less than 18-by-36 inches  much smaller than the innumerable works churned out in subsequent years to feed a faddish poster industry. Like the Mona Lisa or Whistlers Mother, the Haights modestly sized but signally ambitious images have been reproduced, imitated and parodied so often, removed from all context, that theyve taken on larger-than-life dimensions in the collective memory. Just a few weeks after he created the Blues Project poster, Wilson ensured his place among the crucial five graphic artists of the hippie era with posters such as Association, Quicksilver Messenger Service, Grassroots, Sopwith Camel, Fillmore Auditorium, July 22-23, 1966. It features a fiery swirl of red writing on a green ground, each letter a tongue of flame. In Wilsons work as in that of his colleagues, reading became a bit of an acid test, too  that is, deciphering unique distortions and designs to receive insider information. The patience and effort required to decrypt such advertisements seems astonishing now, even quaint. The art of High Societies makes many such distinctions between that era and this one. Consider, for example, the glorification of marvelously real womens curvy, fleshy bodies, another enthusiasm the psychedelic artists shared with their Art Nouveau forebears. Defying the fashion industrys then-new infatuation with waif supermodels such as Twiggy and Jean Shrimpton, the often-arresting eroticism of psychedelic posters praised the body opulent. Perhaps the hippies couldnt help but love hips. That question had been at the heart of beatnik culture and the folk revival. It was a question as old as Americas labor movement and as contemporary as the civil rights crusade  which, like so much else in American life, was about to be fragmented by war, assassination, riots and disillusionment. It didnt take anything so cataclysmic, however, to undo the Haight-Ashbury scene. Success was sufficient. The Hood exhibition features announcements for The Gathering of the Tribes for a Human Be-In, from January 1967. These include Griffins pow-wow-themed image of an Indian on horseback playing an electric guitar, and Mouse and Bowens mind-bending masterpiece of decorative neo-Nouveau featuring a yogi with a prominent third eye. More of a talkathon than a concert, the Be-In featured LSD pioneer Timothy Leary, poets Allen Ginsberg and Lawrence Ferlinghetti and political activist Jerry Rubin, as well as many other artists and orators. The best-attended and, by all accounts, most memorable of the eras happenings, the Be-In garnered nationwide media attention, which began to sell the story of San Franciscos come-as-you-are counterculture. Then the June 1967 Monterey Pop festival  and its documentary film  made international stars of several Bay-area bands. These included Big Brother and the Holding Company, with its singer Janis Joplin, and The Jefferson Airplane, which had lured Grace Slick from the Great Society. During the resultant Summer of Love, interlopers from around the world converged on Haight-Ashbury as wannabe hippies, dedicated drug abusers and titillated tourists. The invasion destroyed the psychedelic community by sheer dilution, not to mention a sudden spike in violent crime and the swift, dispiriting commercialization of a dream that was intended to be given away.